You know that Rolling Stones song, “Cool, Calm, Collected”? It’s one of many vaguely misogynistic songs in the Stones back catalog, and it features the following lyrics: In public the strain’s hard to bear / She exudes such a confident air / But behind she is not without care / She sweeps it right under her hair. That’s basically Green Girl if Kate Zambreno didn’t have the patience and talent to think through how She feels. That being said, I like that Rolling Stones song, even if Mick’s delivery stings, and I’m not sure if it’s necessary to look at the world through Her eyes. It might be a useless experiment, which is neither good nor bad; it’s something amorphous, the experience of which I haven’t figured out yet. Here’s another way to look at it. Robert Christgau once said, “Nico is what happens when the bloodless wager their minds on the wisdom of the blood and the suicidal make something of their lives.” Green Girl is what happens when the blood wagers her mind on the wisdom of the bloodless and turns her life to making something out of suicide. And I think I want the blood, in other words. Give me the blood! Sometimes a book’s idea, not its execution, can throw you into a rant. Isn’t this angsty-PYT stuff boring to anyone else? Stories of big-city-living with usually white, early-20s, sexually active, generally confused women can be unparalleled in how rote they are. It doesn’t matter if the woman at the center of it is quirky, tragically clueless, impossibly squeamish, or whatever endearing personality trait you’d like to affix onto her. It can be a boring story, where nothing surprising happens and no one learns anything. And when coming-of-age stories are boring, they are less palatable to people who aren’t going or haven’t gone through the exact same things at the exact same time. Like a band’s album that gets billed as “for serious fans only,” that story gets marginalized, and it becomes harder to do what books that move us seemingly beg us to do: share them. I want to share Green Girl, but it’s really hard to do that when it’s so completely enveloped in its niche, even as it criticizes and deconstructs. Green Girl tells a solipsistic story about a would-be ingenue named Ruth. Her mother is dead, and her father is absent but for wads of cash at Christmas. She works as a temp in a closeted version of Harrod’s that is nicknamed Horrid’s, and she lives in various parts of East London, verbally assaulted daily like Catherine Deneuve in Repulsion. Ruth is obsessed with: an enigmatic ex-boyfriend she refers to as HIM in Elfriede Jelinek caps; all the beautiful clothes at Liberty that she cannot own (wow, been there); her frenemy Agnes, who is self-involved and cruel but tons of fun; and, most importantly, herself. The authorial voice creeps up, standing in for the mother Ruth no longer has and will not get to speak to, and adds a layer to the mid-century chic voyeurism. If you have ever wondered what will happen to the young girls you see dressed to please every second of their lives, then this book does most of the work for you, alternating between moments of truth and performance, paying attention to someone that both craves and despises it. Kate Zambreno does not hide her story’s apt comparisons. In fact, she celebrates and suffocates them. This is The Bell Jar with a Sophie Kinsella mise-en-scène; Persona with good-time girls; Daisy Buchanan if she were single and working for her rent; and more blank-meets-blank elevator pitches than you know what to do with. Every chapter, it seems, is suffused with the 20th century, making for a quick read if you can hop along those steps with her (Varda, check; Benjamin, check; Breathless, check; etc., etc., until your entire undergraduate cool-kid syllabus is filled). 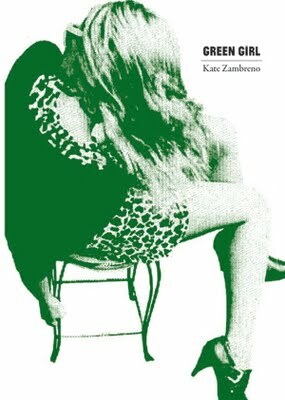 Zambreno writes cleverly and well, with glamor and irony, and finishing her chapters gives the reader a heady rush. There’s this really great scene, for example, where a hopeless weird suitor tells Ruth about the saints who mutilated themselves. You get a shiver from the diversion, but then you see that this won’t matter for her. All Ruth cares about is Ruth; she’s all she has, she says. And in any case, she mostly just likes him looking at her, which makes me bored and angry with her at the same time. Bored anger! I have never experienced it quite like I did in this book. But I can feel that emotion softening as I get farther away from how I felt reading it, so who knows? Perhaps I’ll love this thing in a week and declare war on anyone who spites it.